Leprosy stigma is a kind of social stigma, a strong feeling that a leprosy patient is shameful and is not accepted normally in society. It is also called leprosy related stigma, leprostigma, and stigma of leprosy. Sociologist and writer Erving Goffman made a definition that stigma is an attribute that is deeply discrediting; a stigmatized individual is one who is not accepted and not accorded the respect and regard of his peers, who is disqualified from full social acceptance. It is caused by 1) the physical deformities, 2) blemishes of character such as alcoholism 3) by race, nation, social class, sexuality and religion. 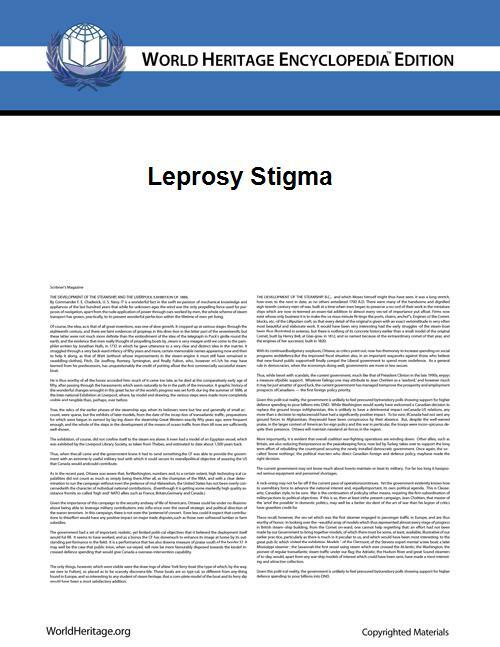 In a paper entitled leprosy stigma, William Jopling cited the definition of stigma by Erving Goffman and wrote that there are three types of stigmatized individuals in one disease, leprosy. 1) Physical deformities such as facial plaques especially in reaction, facial palsy, claw hand deformity or footdrop 2) blemish character in a leprosarium 3) tribal stigma or people belonging to a poor social class. The history of leprosy stigma is as old as the history of leprosy. In Western Europe it reached its peak in the Middle Ages since the Church considered leprosy as "unclean", and many "lazar houses" were built. Patients had carried bells to signal their presence. Since leprosy was found infectious, another kind of cause worsened leprosy stigma. In Japan, forced segregation strengthened leprosy stigma. Leprosy stigma has been universal, and has been present in all parts where leprosy was present. Jopling's hospital was in England, and patients were mostly foreigners who came from other countries after the war. Case 1. A 27-year-old male Indian with leprosy and kidney trouble could not receive proper treatment, though he was given a kidney transplant. Case 2. A 60-year-old man with leprosy developed ulcerations of his stump because of the ignorance of his doctor. Case 3. The wife of a patient with leprosy, because of strong fear of her family, became a recluse and died prematurely. Case 4. A 17-year-old man with borderline leprosy joined the British Army in spite of his dilemma. Seven years later his secret was revealed and he was discharged. Case 5. A young Indian with tuberculoid leprosy improved, and one year later he admitted that he would have committed suicide had the diagnosis been made in his country. Case 6. A Maltese man attempted to commit suicide unsuccessfully. Case 7. Of three suicide attempts, one was successful. He left a note saying that he could not face life with leprosy. In medieval times, leprosy patients lived apart from healthy people around temples or shrines and they begged mercy to passers-by. Starting in 1909, leprosy patients were hospitalized in the leprosy sanatoria, by the leprosy prevention law. In later years, they were forcibly taken to the sanatoria and their houses were disinfected in the presence of neighbors, and the families were also affected by leprosy stigma. This is called forced segregation. Some of them attempted suicide. The law lasted until 1996. In Kumamoto, Japan, there was a case of explosion in 1951 and murder in 1952, and the accused was a patient named Matsuo Fujimoto with leprosy. During the questioning and trial procedures, he received discrimination because he was a leprosy patient. He was executed in 1962. Kumamoto Prefecture Governor Yoshiko Shiotani made it public that a hotel rejected reservations of ex-patients of Kikuchi Keifuen Sanatorium on the Prefecture's home visit program based on leprosy stigma on Nov. 18, 2003. Many people protested against the hotel. When the patients rejected the external apology of the hotel, there were many violent protests against the patients. The hotel tore down the hotel building in June 2004. In the Jopling's original report, he quoted Hansen as saying "the Norwegian state has always handled its leprosy victims humanely". Hospitalized in-patients were free by day to sell their handwork in the market, or to entertain visitors. Hence there was little evidence of stigma. Many patients went to America, not from stigma, but from poverty. There was considerable "leprosy stigma". The concept of heredity was deeply rooted and they considered deformity as divine punishment and there was considerable leprosy stigma; even doctors shared it. Leprosy stigma has been considerable, though it has declined recently. Facial disfigurement, mutilation of limbs, chronicity and long incubation period caused mystery about its origins, inspiring horror, fear and disgust. In 1884, the Louisiana legislature established a State Board of Leprosy Control, and in 1917 the US Congress passed a bill to create a national leprosarium. The admission was on voluntary basis. In 1941, Stanley Stein published a journal The Star to combat leprosy stigma. His efforts were enormously aided by the discovery at the U.S. National Leprosarium in Carville LA of the clinical effectiveness of the intravenous sulfone, Promin. Jopling's children who lived in the Jordan Hospital with Jopling could not receive their friends because their parents did not allow them to visit Jopling's children. 3 years later, their friends could visit the Jopling's children. Children born of parents in Kumamoto, Japan, could not attend primary school; many inhabitants went on strike. Doctors, nurses and workers working in leprosaria have been affected by leprosy stigma of lesser degrees in the past. The general public has misconceptions about leprosy, particularly regarding the degree of its contagiousness, and a campaign should be carried out to enhance public knowledge of leprosy's curability. Doctors and nurses who are ignorant of leprosy may worsen leprosy stigma. The presence of lazar hospitals, leprosaria, colonies is the reflection of leprosy stigma. Some of the leprosaria and colonies are situated in remote lands or islands. In the past, there was a history of the press which worsened leprosy stigma. Wim H. van Brakel, head of the Leprosy Unit at the Royal Tropical Institute, wrote in "Analyzing Stigma"  that stigma has three components; perceived stigma(or felt) stigma, enacted stigma(or discrimination) and internalized (or self) stigma. He further wrote that leprosy is one of the oldest stigmatized conditions known, and suggested that further studies be made. Stanley Stein, a blind patient, started The Star, a crusading international magazine against leprosy stigma, at Carville; this journal accomplished great achievements in raising awareness of Hansen's Disease. On the back page there was a simple but appropriate explanation of leprosy. The full text of the STAR Newsletter, 1941 - 2001 is available online. The Star continues to be published twice a year. New copies are published on the 40 & 8 La Societe des Quarante Hommes et Huit Chevaux website. The back cover still includes facts about Hansen's Disease. National Hansen's Disease Museum (Japan) in Tokyo, Japan is a representative museum showing the history of leprosy in Japan, for the eradication of leprosy stigma. It is situated next to the Tama Zenshoen Sanatorium. There are smaller museums in other sanatoriums in Japan, such as in Tohoku Shinseien Sanatorium, Kuryu Rakusen-en Sanatorium, Nagashima Aiseien Sanatorium and Kikuchi Keifuen Sanatorium. National Hansen's Disease Museum in Carville, Louisiana collects, preserves and interprets the medical and cultural artifacts of the Carville Historic District and promotes the understanding, identification and treatment of Hansen's Disease (leprosy) by creating and maintaining museum displays, traveling exhibits, publications and a Web site in order to educate and inform the public. ^ William Jopling. Leprosy stigma in Leprosy Review (1991), 62, 1-12. ^ 40 & 8 La Societe des Quarante Hommes et Huit Chevaux. http://www.fortyandeight.org/the-star/ Retrieved 6 February 2012. ^ "Facts about Hansen's Disease." The Star (July–December 2011) 63(12): 16. http://www.fortyandeight.org/storage/The%20Star%20July-December%202011%2012-20-2011.pdf Retrieved 6 February 2012. ^ The National Hansen's Disease Museum. http://www.hrsa.gov/hansensdisease/museum/index.html Retrieved 6 February 2012. Infolep Leprosy Information Services gives a subject guide on leprosy related stigma.